Welcome to Writing Children's Books with Robyn Opie. We have a special guest today. Oooh, I love special guests! Dee White is visiting on her Tuesday Writing Tips Blog Tour. She's here to talk to me about my book, Black Baron - and how to write bigger stories. 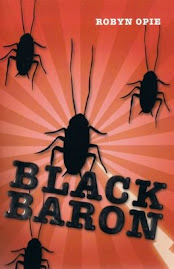 Dee: Hi Robyn, I loved your book, Black Baron and my boys did too. We are so pleased to be here today to find out how you wrote it. Could you start by giving us a brief summary of what the book is about? Robyn: Hi Dee. Thank you for including me in your Tuesday Writing Tips blog tour. I'm pleased to have you here. And thank you for your kind words about Black Baron. I'm glad you and your boys loved it. I decided I wouldn't re-invent the wheel and create a new summary. So here is the blurb from the Walker Books Australia website: "Black Baron, Jake's champion racing cockroach, hasn't lost a race and Jake is on top of the world. But then his mum decides to clean up his bedroom and discovers Black Baron in a shoebox under Jake’s bed. Mum is aghast -- how could Jake keep such a filthy pest? But Black Baron escapes and Jake's Mum calls the pest exterminator and a humorous slapstick tale ensues." Dee: I understand that Black Baron was longer than any previous book you had written. Did you find that daunting when you started writing it – knowing it had to be a lot longer? Robyn: I'd been writing short texts for school readers. When I started Black Baron, the longest story I'd written in recent years was probably around 1,200 words. I didn't think about it at the time. I knew Black Baron was going to be a novel and that the manuscript had to be longer than my recent works. I hadn't written a novel greater than 4,500 words at this point and not for several years. I can't say that I was daunted because I didn't know that I was going to find the task difficult or challenging. But when I started writing Black Baron, I discovered that years of writing short texts for school readers had taught me to write concisely. That is good, of course. But one can write too concisely. I realised that I left out a lot of information, like action and setting. In a way, I wrote skeletons and this skeleton, Black Baron, needed fleshing out. Dee: Why did Black Baron have to be longer? Robyn: The simple answer is to fit the market, so I had a chance of Black Baron being published by a trade publisher. There is a limited market for stories less than 1,200 words, which I was used to writing. Black Baron had to be novel-length, or at least somewhere in the vicinity. Several publishers had told me that they didn't publish children's books under 15,000 words - 15,000 was their minimum, though they preferred upwards of 20,000. These publishers publish shorter books now but that was what I was told several years ago. I guess I was ready for the challenge, too, to write a longer work and broaden my horizons. Dee: Did you plot it all out and the book came out to be the ‘right’ length or did you have to add things along the way? Robyn: I did a plot outline for Black Baron. I don't like to start writing unless I know the ending to a story. I feel as if I need something to aim for, or else I might get lost on the way and never reach the end. I hated cockroaches and thought of them as "stinking, rotten cockroaches", rather like Jake's parents feel in the book. As far as I was concerned Black Baron was going to die. But as I wrote the story, I fell in love with Black Baron. He's my character, after all, and I brought him to life, and pretty soon he had a place in my heart. Needless to say, I decided on a new ending to my story. Long live the champ! The story was too short, nowhere near the right length. As I mentioned above, I realised that I wrote too concisely and left information out, about the characters, the action and the setting. I had to keep going back and inserting that extra information. I needed to add muscles and flesh to the skeleton's bones. I probably ended up going through the manuscript four or five times (at least! ), adding more and more layers. That's the way I feel about Black Baron, as if I wrote it in layers. All of my previous books, the school readers, were illustrated so the pictures told a lot of the story and they were also limited in terms of characterisation, action and setting. Black Baron needed more to be explained or experienced through the text. Dee: When you added layers to your story, did this involve developing characters, adding more description or creating more action? Or a combination of all three? Can you tell us how you did it? Robyn: It involved all three. In the school readers, I'd been writing in recent years, I didn't need any characterisation at all. No details about the characters or their relationships. So I had to focus on the extra bits that would make Jake, his parents and Black Baron seem real. I also had to add more thoughts and feelings from Jake, my point of view main character. I had to work on adding more description and action, but only what seemed necessary. Each time I went through the manuscript, at least four or five times (maybe more), I added more to make the story seem realistic and believable. I thought about the descriptions, settings and action. Initially, I'd left a lot out and could expand on these areas. And I should also mention that I initially wrote Black Baron in third person point of view. I changed the manuscript to first person, to see what would happen. I managed to connect with Jake, as if I was him. In fact, I probably became Jake because I was writing from the "I" point of view. Black Baron helped me learn how to "show, don't tell". I often suggest to people who are having trouble with "show, don't tell" to write from the "I" point of view and pretend that they are the main character. You're not a writer, you're the main character. That way, it's easier to "show" everything from the main character's point of view by imagining you're that character and including what you can see, hear, think and feel. Dee: Did you have to go back and re-plot parts of the story to make it longer? Robyn: As I mentioned above, I went back and re-plotted the ending, after falling in love with my character Black Baron. I also had to add extra scenes or events to the story. I guess it's a bit like going straight from A to E. I can go straight there, A to E, or I can include B, C, and D on the way. I hope that makes sense. My first draft of Black Baron involved the plot I wanted to write. Start to finish, getting there as easily and as simply - or concisely - as possible. But the manuscript was too short, around 4,000 to 5,000 words. Knowing I needed to make it longer, I returned to the manuscript and thought about the existing scenes. Then I thought about what these existing scenes meant in regards to cause and effect. You know the idea of cause and effect - one event causes something to happen which causes something to happen and so forth. What else could happen? I realised that there were more opportunities with the story. I didn't have to get to the end so quickly. I could enjoy the journey on the way, draw it out, as long as everything seemed to be in the story because of cause and effect. Plus, I was now Jake, the main character, and not a writer. I could imagine what "I" did and how "I" reacted, thus making it easier to create new cause and effort scenes. Dee: So, Robyn, can you give us a tip for fellow writers who are trying to increase their word count to meet a publisher or competition requirement? Robyn: Please visit Dee White's blog - http://deescribewriting.wordpress.com - for my final answer and tip of the day. Writing Picture Books - Leaving room for the illustrator. Reviewing ‘There Was an Old Sailor’ - Reviewing vs Editing skills. Welcome to Writing Children's Books with Robyn Opie. Today, Claire Saxby has come back to visit us as part of her new blog tour. Yes, Claire has another picture book, which was released this month. Congratulations, Claire! 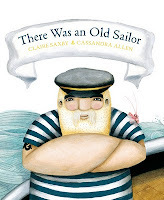 Today, Claire is talking to us about There Was an Old Sailor and how she went from idea to book. Sound easy? Let's hear what Claire has to say about that. Welcome Claire - and over to you. I was sitting watching my son and his circus classmates do their warm-ups when my friend and her daughter arrived. Her daughter stripped off her shoes and socks and joined the others on the mat. My storyteller friend dropped into the chair near me and said ‘I wish someone would write a fishy rhyme…you know…like “There Was an Old Lady”.’ She was just back from a storytelling session and bemoaned the fact that there was no nautical cumulative rhyme in this Year of the Ocean. ‘And everyone wants fishy tales,’ she said. And so the idea for ‘There Was an Old Sailor’ was born. Easy, I thought. Hah! I should know better. Less words generally means more difficult, when it comes to picture books. Certainly has for me anyway. My first picture book, Ebi’s Boat’ has 198 words. And when you consider that when you are modeling on an existing rhyme, you can’t fudge any of the lines or play with the structure, it’s a bit like dancing with an octopus in a shower…dangly bits everywhere! Where to start? Well that at least seemed obvious. The animals. So I built a list of eight sea animals. Krill and whale were my bookends. Made sense, although I worried a little about children not knowing what krill were. The other six animals changed a few times as I played with the rhymes. Most had to be single syllable, so jellyfish became jelly, stingray became ray (more accurate terms any way I discovered). I shared progress with my storyteller friend and her enthusiasm kept me buoyant when the rhymes wouldn’t come and it all seemed futile. Eventually the story was done and I sent it off to publishers. No response. Well, yes, there were responses, but nothing to tell me why they didn’t want it. That’s just the way it is, often. So after a few submissions, I was again despondent. Then my storyteller friend arrived with a present for me…a bollard sailor with a wide open mouth. She’d been taking my story into classrooms and kindergartens and they loved it. So her husband had made two sailors, one for her, one for me. We searched shops for the fishy creatures to perform the rhyme. Some were easy…fish are everywhere. But krill? Hmm not so easy. Eventually we found a fishing supply store who gave us shrimp/krill looking lures, complete with hook and sinker. Children love the Old Sailor and love helping to feed him. Around that time I was asked to do a writing workshop for upper primary children and developed one around the Old Sailor. It was and continues to be a fun and successful workshop. I began to think that perhaps that was the Old Sailor’s destiny, rather than to be a book. But then I sent out the manuscript once more. Walker Books accepted it and Cassandra Allen agreed to illustrate it. On Feb 1 2010, There Was an Old Sailor hit the bookshops. Magic. Just magic. It only took eight years. Thanks for hosting me, Robyn. Thanks for visiting, Claire, and sharing your experiences.